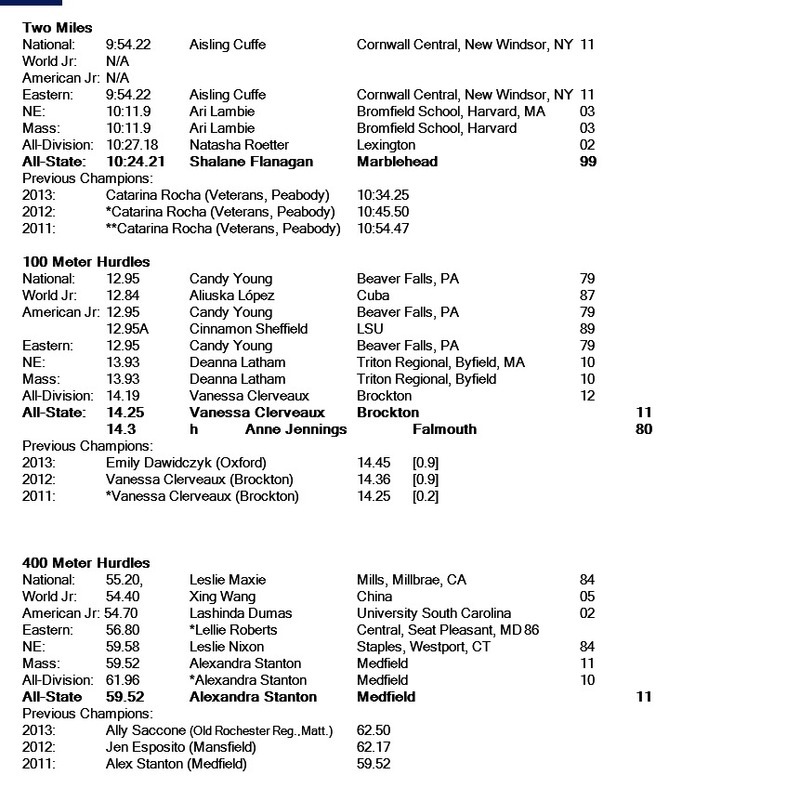 Listed below is a look at the updated event-records for the 2014 Mass. All-State Meeting, scheduled for this Saturday, June10, at Bridgewater State College. 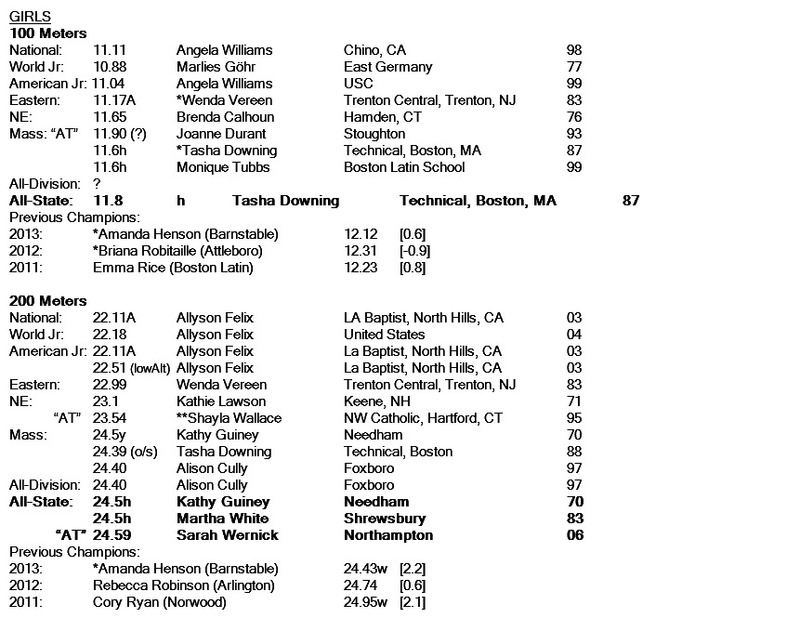 Like some of the Divisional Records, a few of the sprint races and relays need a bit more research to unearth correct FAT that should be listed in the records section. 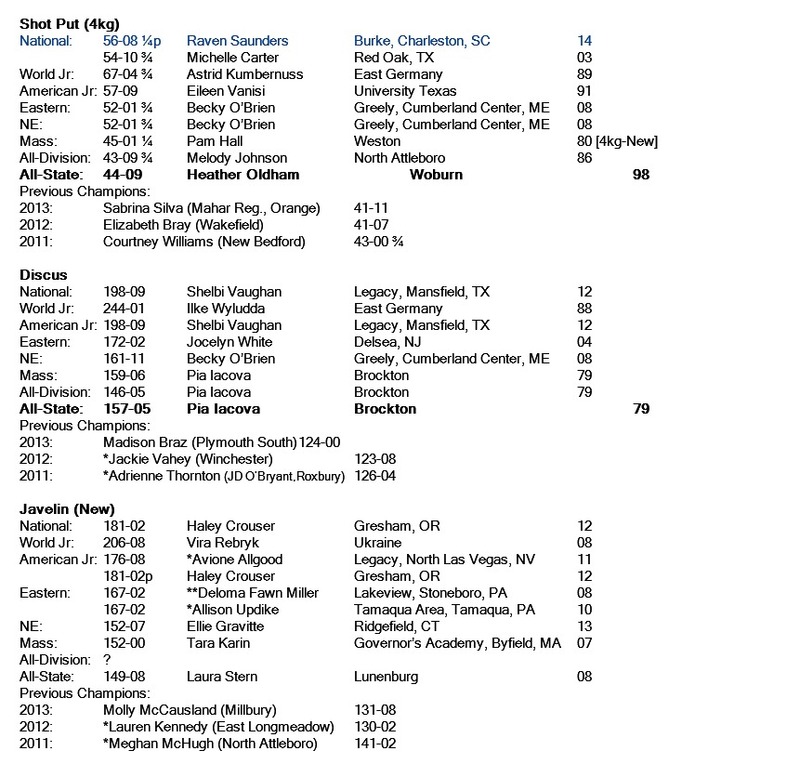 I have added World Jr. Records as well as a few years of previous champions. 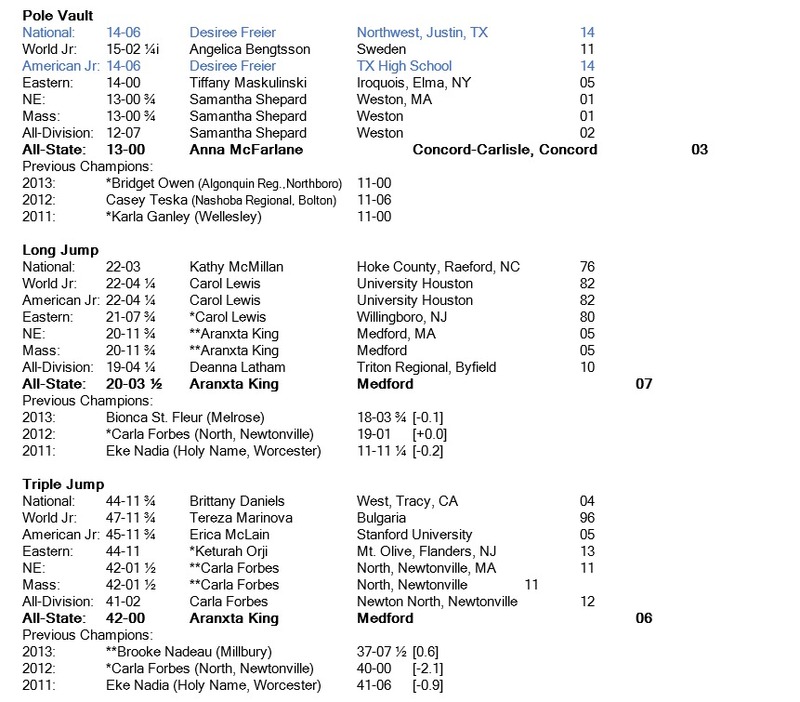 By next year I’ll have completed a complete list of both the boys and girls champions. 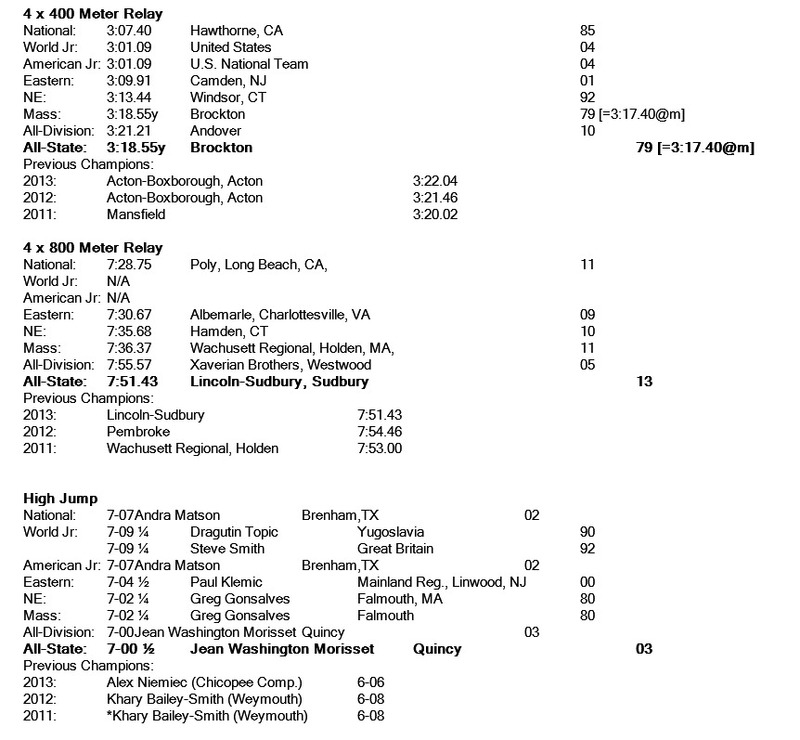 Oldest All-State record on the books belongs to Wareham’s Greg Ouellette, who long-jumped 23-10 ½ back in 1965…my frosh year in high school! 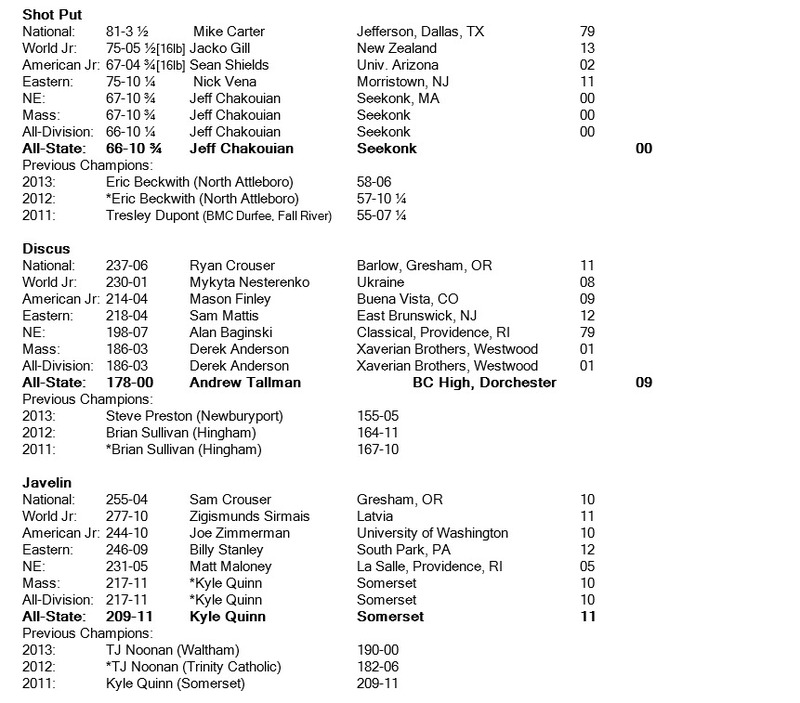 Just as a point of reference I left in the updated All-Division record from last weekend’s championships. 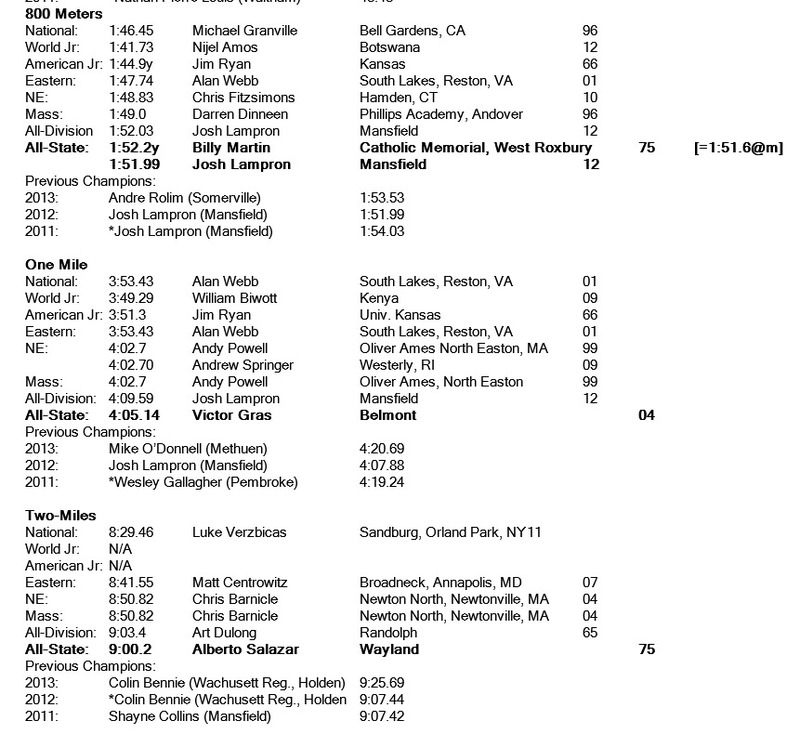 Once research is complete, up-to-date accurate records will be posted on MileSplit. 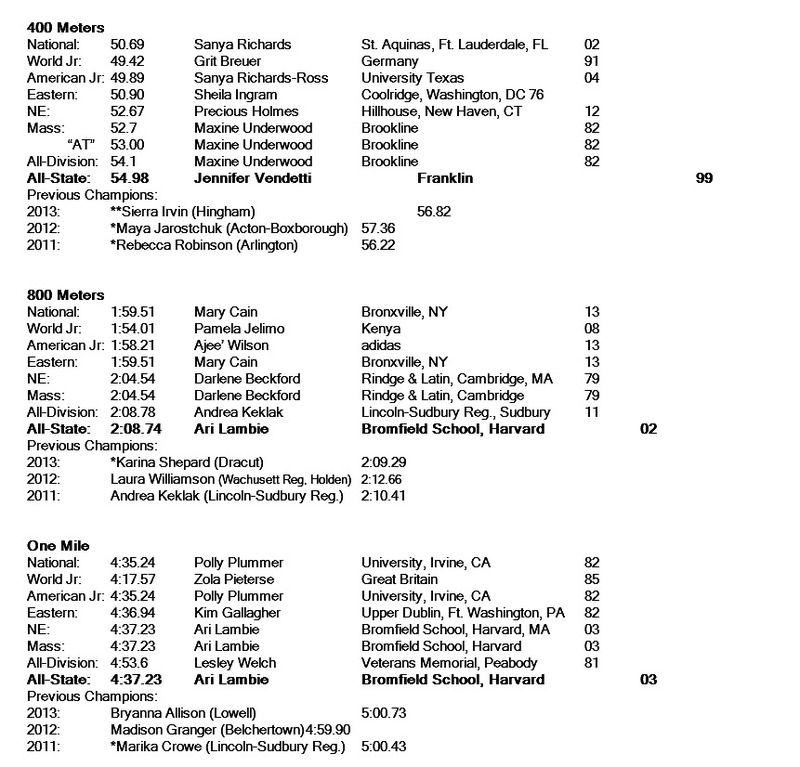 National Records and additional research from Jack Shepard, Track & Field News. 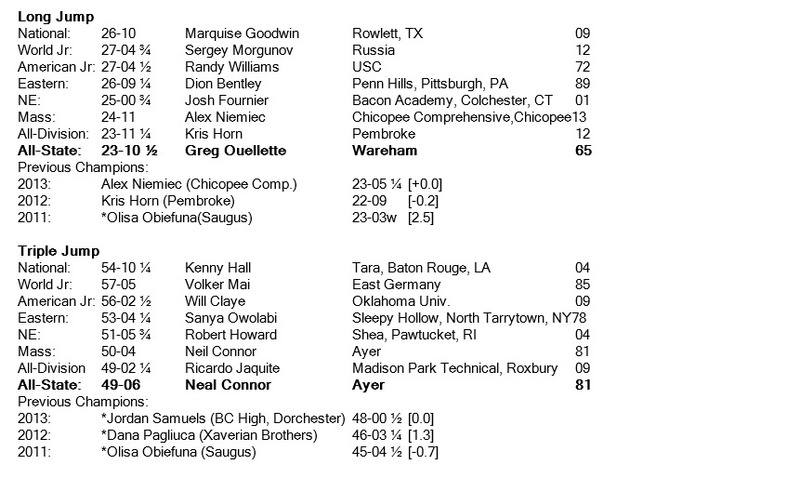 World Junior Records are those ratified by the IAAF. 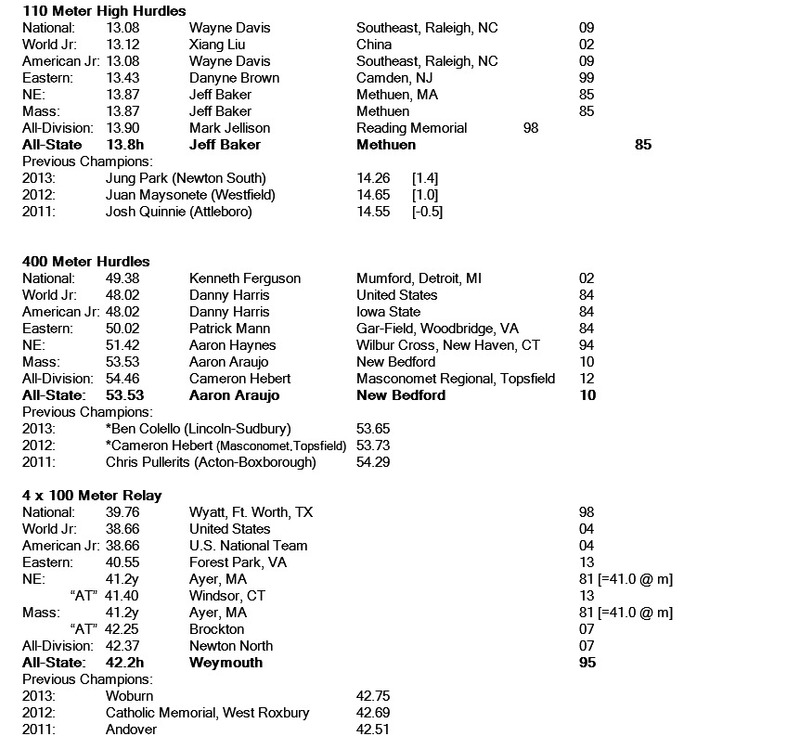 American Junior Records are those ratified by USATF. 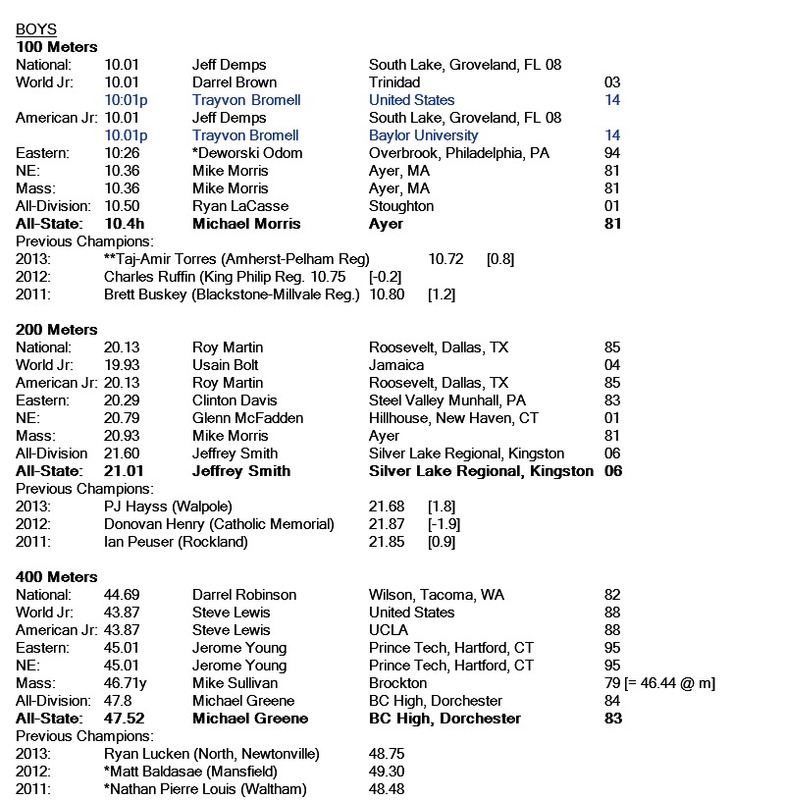 Junior Records are restricted to athletes who do not turn 20 at any time during the calendar year in which the mark is made. 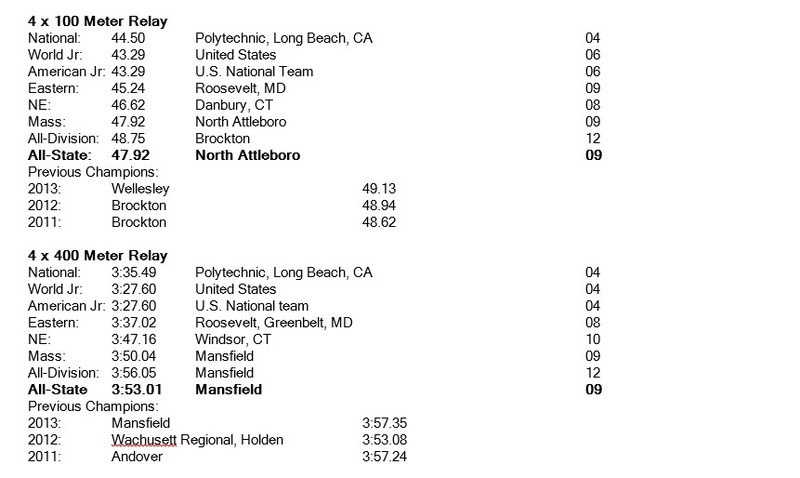 Eastern Records are those compiled by Eastern Track’s Walt Murphy [wmurphy25@aol.com] and include the states from Maine to Virginia. New England and Mass. 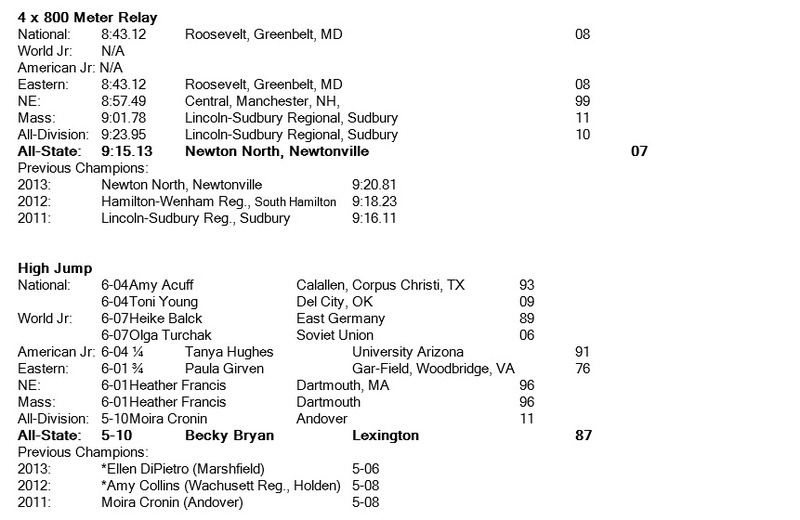 records are those compiled by Larry Byrne [ltbyrne1016@verizon.net] and Larry Newman [netrack@aol.com]. p= record pending verification; *** = Freshman, ** = Sophomore, * = Junior. All others are Seniors. Corrections, comments, criticisms [if any], welcomed.